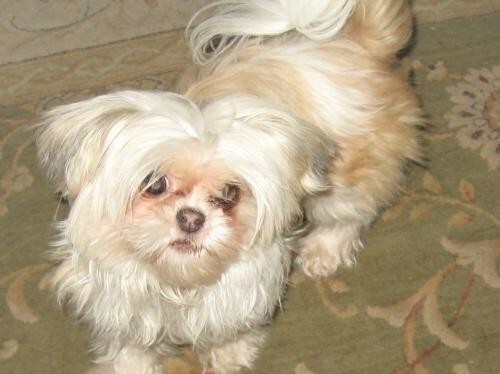 Kiki is a sweet little girl small and timid that needs a safe adult home. . Her hair is silky and tangles very easily and her eyes need to be cleaned often. She does not do well on stairs or jumping on furniture. she is some what out of proportion with her back legs being higher than her front and can loose her balance at times.. In spite of her tiny size she is high maintenance and can only be adopted by someone who can commit to HER needs. This little dog has had 3 homes already and the transitions are hard on her.. She will require trips to the groomers and dental maintenance, as do all tiny none shedding dogs. She is fine with other dogs, but not a great playmate. Please include some information about your experience and the home that you can provide for Kiki Contact Cathy@staranimalrescue.orgTo see all of STAR's wonderful adoptable animals, visit us on Facebook (please Like our page- staranimalrescue) or go to our website www.staranimalrescue.org. We are animal rescue volunteers with many years experience in placing animals in permanent homes. We work with local shelters and other organizations to rescue animals they cannot place. There is no application form, just email the foster home and they can arrange an appointment.